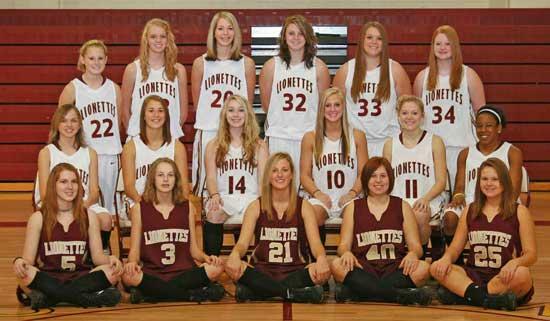 The 2009-10 Cannon County Basketball Lionettes are, front row from left, Abbey Spry, Camille Gilley, Emily Pemberton, Janna Reed and Marion Wallace. Middle row from left are Jordan Hollis, Lindsey Reed, Erica Melton, Ashley Campbell, Emily Sissom and Joanna Young. Back row from left are Abby Jakes, Taylor King, Ashley Basham, Lauren Ruehlen, Shelby Jordan and Chelsey Payne. The Cannon County Lionettes will begin their 2009-2010 season Tuesday night, November 17, at Bledsoe County High School where they will play in a "Hall of Champions" game. The Lionettes will also travel to Tullahoma Thursday, November 19, to play in a second "Hall of Champions" game. Both games will start at 6:00 p.m.